I was never a fan of a red velvet cake recipe until I tried this recipe! Once I tasted this red velvet cake, topped with cream cheese frosting, I finally figured out why people LOVE a real red velvet cake recipe. This cake is buttery, soft and truly lives up to it’s velvet description. This recipe is updated from a previous recipe that I used and is a million times better! That’s the thing with baking, you are always learning and improving. I wanted a red velvet cake recipe that was super classic and wasn’t just vanilla cake with food color added (yuck). I tested this recipe out on a client who’s favorite cake flavor was red velvet and she said it was the best she’s ever had so I think that is a win. Is red velvet cake just a chocolate cake recipe with red food coloring added? Red velvet cake isn’t just a chocolate cake with red food coloring added. 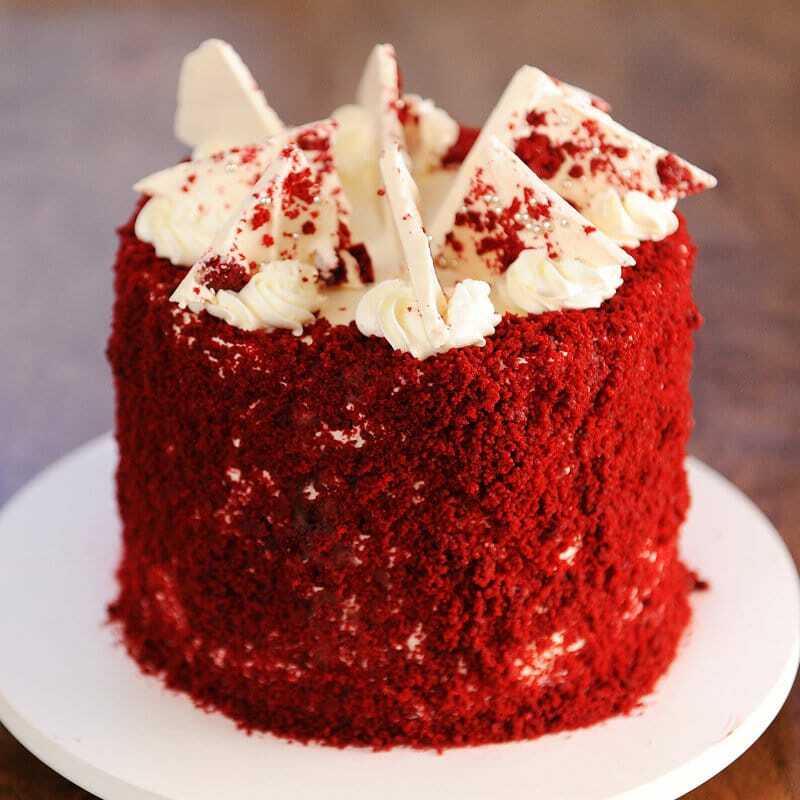 In fact, the original red velvet cake got it’s name because the buttermilk and the vinegar naturally brings out the red undertones in the cocoa powder, giving the cake a red tint. Buttermilk and vinegar also breaks down the gluten in flour resulting in a more tender cake which is probably why it got the nickname red velvet. 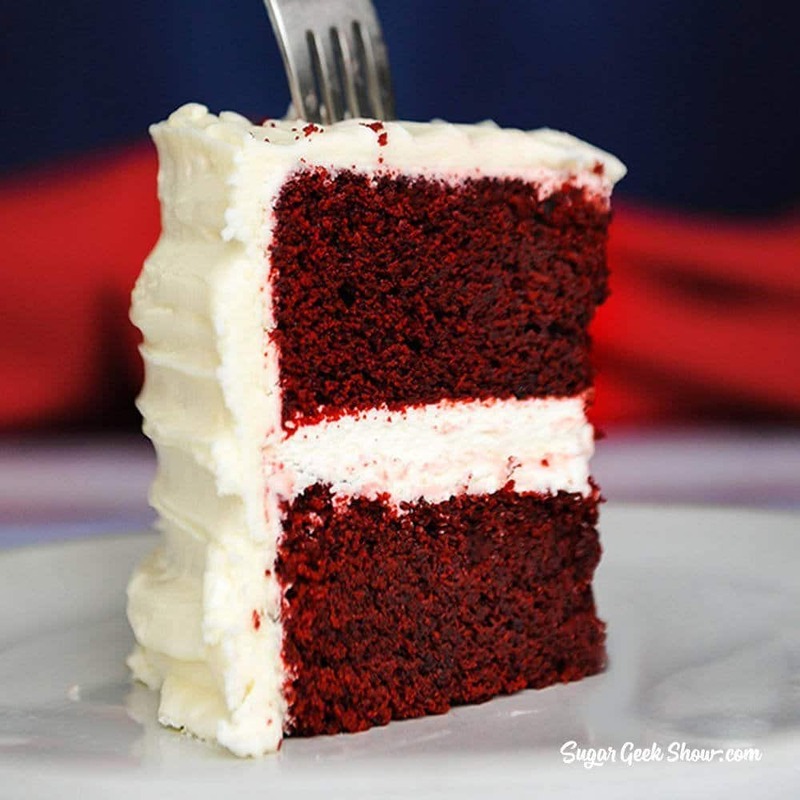 Of course over the years a little red food coloring was added to intensify the color to what we see today, which is why people can get confused about what the flavor of a true red velvet cake recipe is supposed to be. Some inexperienced bakers may even just add red food coloring to a vanilla cake. Red food coloring actually tastes really bitter so if you’ve ever had an overly colored red velvet cake recipe, it probably tasted really bad. What does a real red velvet cake recipe taste like? A real red velvet cake recipe is made with buttermilk, vinegar and a tiny bit of cocoa powder. These ingredients result in a very tangy cake with a hint of chocolate. 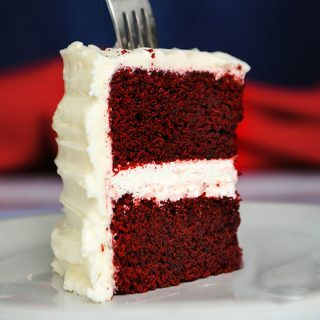 This is a pretty unique flavor combination but when you add in some cream cheese frosting or ermine frosting (the classic frosting for red velvet cake), then it adds even more tangy flavor. That tangy flavor is the sign of a true red velvet cake recipe. Why is red velvet cake such a popular flavor? I personally think that red velvet cake is popular due to two factors. Some people have had a TRUE red velvet cake recipe and love it! I don’t blame them, it really is delicious. The other factor is that it’s a very controversial cake flavor. If you haven’t had a really good red velvet cake and you associate the cake with just a bland red cake then you won’t see what the big deal is. Whenever there is a controversy between is something good or not, it always becomes more popular. There is a saying in art, if it’s good then people will either love it or hate it. If everyone just feels “ok” about it, then it’s just meh. Same with cake, people seem to either love or hate red velvet cake. Ok this is the really the only cake recipe I make that’s a one bowl method. Typically I prefer a more precise mixing method like the reverse creaming method. 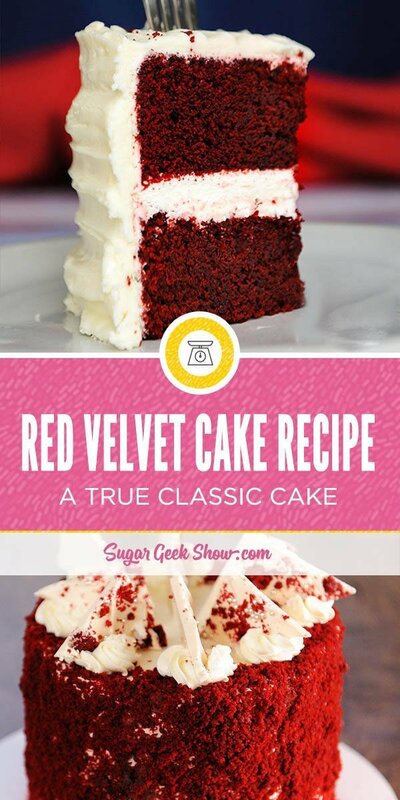 This red velvet cake recipe is soooo super easy! Just combine the flour, sugar, cocoa powder, salt and baking soda in a bowl. Whisk together the eggs, vegetable oil, buttermilk, melted butter, vinegar, vanilla and coloring in separate bowl. Slowly add in the wet ingredients to the dry and mix for one minute. You can do this by hand or in a stand mixer with the paddle attachment. Pour batter into two 8″ round cake pans and bake! I like to frost and fill my cake with cream cheese frosting and then use some of the cake trimmings (from removing the dome) to make a pretty cake crumb coating on the outside. Garnish with a little white chocolate and boom! That’s one pretty red velvet cake. Can this recipe be made into cupcakes? – Yes you can definitely use this recipe for cupcakes. I have made them many times and they turn out really well. What can I use if I don’t have buttermilk? – You can use an equal amount (by weight) of sour cream or you can add 1 Tbsp of vinegar into regular milk and let it sit af ew minutes until it starts to curdle to make homemade buttermilk. Can I leave out the red food coloring? Yes you can but the cake will not be very red on the inside. Amazing real red velvet cake recipe. One bowl, one spatula, one amazing cake! This recipe makes two 8" round cakes that are 2" tall. The cake is very light and delicate and very moist. Pour into cake pans and bake for about 30 minutes or until a toothpick comes out cleanly. Pairs perfectly with our cream cheese buttercream. Is this recipe sturdy enough for carving? There are 2 red velvet recipes that are very nice and sturdy enough to carve. Cake recipes that are for carving as Liz Merek mentioned are nice flavors but a touch denser so you can carve it. Not for this recipe because it will be too tender! 2 oz of red? Really? I get two tablespoons. Recipe says 2 oz! 😬😬😬. Love this cake btw. First red velvet cake that tastes good to me!! 2oz equals 4 tablespoon? correct? I made this recipe before and it’s been requested by another customer. Can you give me the ratio for a 10” square cake 2” high? The only option is to change it in cups. BTW…so far I’ve made your old vanilla and new vanilla recipe, chocolate cake, black velvet, carrot cake, whipped ganache, cream cheese, LMF etc. I’m a big fan!!!! Liz,is this sturdy enough for stacking and can I increase the batter for a larger pan? Love your recipes! 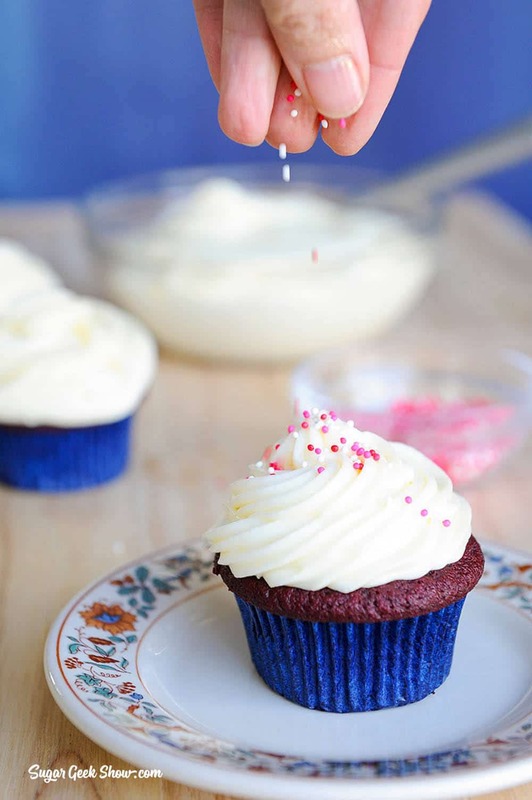 Can you do purple velvet with this recipe? So I tried this recipe yesterday and it’s super yummy, made the house smell amazing!! However, I’m afraid it’s going to turn everyone’s mouth red 😣. I weighed 2 ounces of the americolor, which was most definetly more than 2 Tablespoons. Did you have this problem? Turning everyone’s mouth red? Anything with food color is going to color your mouth temporarily. Just think of things like candy. It’s not permanent. Hi Liz, can I use regular herseys cocoa powder? Will it still taste bomb? Hi Liz! Thanks again for yet another recipe I will never go without. This is the most delicious red velvet recipe I’ve ever made or eaten. But I wanted your expert opinion on a variation. I wanted to try this recipe using black cocoa powder, but that is dutched and this recipe calls for natural cocoa powder. I’ve seen your black velvet recipe, and while that looks incredible, I really wanted to have the buttermilk and vinegar in for the flavors they impart. 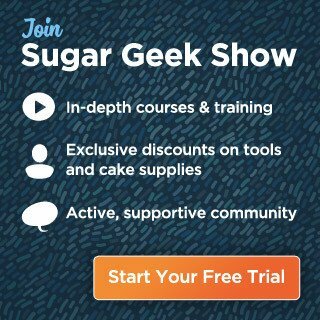 Would I need to change the amounts of baking soda or use some baking powder to use the black cocoa? Hi..Liz..i learn so much about variaty of cake from your blog, thank you. about Red Velvet recipe i waiting your experience for “Complete guide for RV”, include how to make perfect colour RV with beetroot pure with minimal food colouring. 2tsp still too much for me. thanks so muchfor your attention. Even I want to scale down the quantity of red food colour. Can u pl share the technique, tips and quantity of beet purée to be used to make the perfect red velvet cake. Please can u also share the recipe of healthy banana cake. Is the cake sturdy enough to hold sugarpaste Liz? Yes, just make sure it’s chilled well or even partially frozen. I tried this recipe today and it did not worked out for me. The sides are overcooked and the middle is raw. I used a flower nail in the center, bake even strips, and my oven thermometer read 350. The parts that are adequately cooked are delicious and I would love for the whole cake to turn out that way. What could the problem be? You problem was probably that your ingredients where not all room temperature including your milk. If some of your ingredients are cold and some are warm then the cake batter will break and not bake up evenly. I have tried so many of your recipes and every single one is a hit!’!! I’m excited to try this one next. Do you know if these will turn out as cupcakes? You say oz for your sugar and flour amounts as well as oz for your liquid ingredients. Are you measuring both by fluid ounce? Or are you measuring the dry ingredients by weight? Thank you for your quick reply! I am new to measuring ingredients this way. I bought a kitchen scale, it has a fluid ounce setting as well as a weight setting. When you are weighing your ingredients, which setting do you use? Thank you so much! Hi this recipe looks good would love to try it.. Can I make this as cupcakes instead? would it still be the same? Also instead of buttermilk, can I substitute with milk and vinegar? Thanks! Do you add in teh wet ingredients in like in your vanilla cake, or do you add them in all at once? Thank you for sharing this recipe! But I have noticed that there is no baking powder in the ingredients, is the baking Soda is enough by itself? Hello. I can’t wait to taste this recipe and I’m in the middle of making it right now! Could you please help me? I’ve measured the room temp butter to 4oz. When melted, it comes to 2.2oz. Does this recipe call for melted butter measured at 4oz or butter measured out to 4oz then melted? A stick of butter (1/2 cup) is 4oz at room temp. Thanks so much for your help! I think you might be measuring by volume. You must weigh the butter melted or not melted and it should weigh 4oz. Hi! I’m just starting to learn about food coloring so I apologize if this is a silly question. Is the Americolor food coloring a gel paste? Thanks! And just for clarification, does there recipe call for 2 tablespoons or 2 oz. (by weight) or 2 fl. oz of the Americolor gel paste? I read through the comments and was a little confused. Love your recipes! Thanks do much for sharing! Thanks! And just for clarification, does the recipe call for 2 tablespoons or 2 oz. (by weight) or 2 fl. oz of the Americolor gel paste? I read through the comments and was a little confused. Love your recipes! Thanks so much for sharing! Hi, I read thru the comments but I want to make sure I understood. I have a 15th bday cake order for 60 ppl and the girl wants red velvet, I will try yours. It will be a fondan covered cake 3 tiers. Will this cake be able to hold offor is to too moist and tender? Thank you! Yes it can, just make sure your cakes are chilled when you handle them. i’m a bit confused as well, the written recipe say 1 tablespoon of red color but in the comments it refers to 2 TBLspoons then says 2oz in others? I have adjusted the amount of food coloring over time so that I can use as little as possible and still achieve a nice red. Always go by the written recipe. Usually, a scale comes with different modes of measurement, oz or grams. Change the mode to oz. Thanks for the best recipe ! Would you suggest any unsweetened cocoa powder for this recipe ? Please can i use salted butter for this recipe.. Or its compulsory i use unsalted butter? Salted butter has too much salt in it for baking which is why baking recipes tend to use unsalted butter so you can control the amount of salt in them.